This day could not get past me without remembering how exactly one year ago, I lost one of the very best friends I've ever had. There is a bitter/sweetness about this day because one beloved friend left these shores and just a few months later another sweet friend came into my life. As a tribute to him, I am placing an entry from my private journal dated November 24, 2010. Sadly and with much pain in my heart, we allowed our beloved Eliot to leave our shores last Thursday, November 18th at the full age of sixteen years. Until well past his fourteenth birthday, he was strong and vigorous. Then, quite suddenly in the fall of 2008, he began to lose weight. Slowly, ever so slowly, over the past two years his eye sight began to fail and finally, just recently, he started to show signs of renal failure. He became blind with cataracts and even though he did not have any trouble getting around our home, I noticed that it took him quite a while to get where he wanted to go and even longer to remember where it was he needed to go. Through all of this, he never stopped wanting to be held by me and loved to be kissed and hugged. Rubbing his tummy would always result in a warm and happy purr. He never complained when I would go and fetch him out of a deep sleep because I needed a hug. Wrapping his soft paws around my neck, he would nuzzle my ear. My arms ache with emptiness and I am literally lost without him. It is very difficult to even believe that he is forever gone from my life. Never will I forget our long trips back and forth between our previous home in the high mountain town and our new home in our gentle valley. I sang to the sound of the oldies and he meowed. We traveled together many hundreds of miles, just the two of us. There are many stories to tell about Eliot. 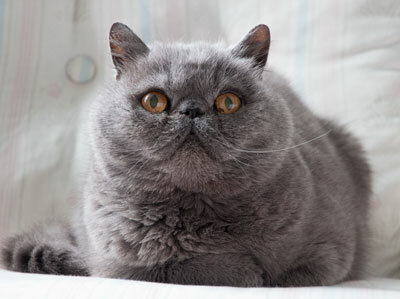 He was very emotive and even his meow would change depending on what it was he had to tell, or ask. He loved to interact in such a way as to look me in the eyes, and sit and gaze into my face, following my eye movement with great interest. After several days of painful grief suddenly washing over me, my tears are lessening. As I think back on his life, I smile remembering all the mischief he wondered into. Those memories are treasures to be kept, forever remembering the life of a loving and generous being, who would have stayed with us until the end if we had asked it of him. However, I could not ask it of him and decided to let him go before he became uncomfortable. I spent the last two days of his life quietly with him. We sat together and talked of many things. I thanked him for staying with me all of these painful years, when my hubby was away and I was alone, without family or friend. During this month of November, while celebrating the gift of being thankful, I am most thankful to the Lord for giving me a gift of the finest of friends. Eliot was my dear friend and I will miss him the rest of my life. After a deliciously long and colorful fall, winter has finally arrived. It teased us with a dusting of snow just a few days past but with the stealthy quiet of kittens' paws, "big" snow has crept into my realm. Large flakes the size of feathers are falling in white silence, resulting in a fluffy carpet several inches deep. Today is my snow day. Even during the loveliness of summer sunshine, my mind drifted to the first day of a hefty snowfall. Summer is magical but winter, cloaked in stillness and purity, is mysterious. As I cocoon in under my quilts with my early morning coffee, all is silent; suspended for the moment. There is cause to pause. One can hear the soft whisper of angels. With contentment, I am allowing my mind to simply drift. There is something mesmerizing about watching snow flakes drift slowly to the earth. 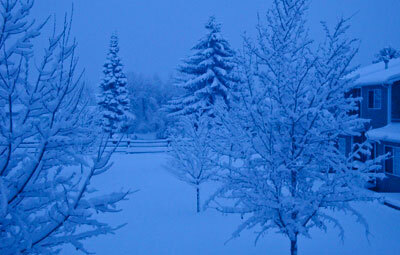 The landscape has been washed clean with the bluish white of early morning under it's blanket of snow. Tiny sparrows are hopping around on the patio, looking for fallen seed off the bird feeder. Often I wonder if their little feet get cold. They line up like small nobs on the back of the bench, all fluffed up, looking as if they do not even have feet. Lovely finches sit at the feeder picking through the seed, all the while knocking most it off, and tiny sparrows hop around on the ground looking for their favorites. Winter manages to bring life into crystalline focus. Coziness and danger walk side by side. It is but a simple slip to fall into either one. It is also a time of contrasts and extremes. There is a challenge to make it through, but all of us who abide in this mountain valley survive rather well. In fact, we are all brought into an awareness of how powerful and relentless the elements are. When spring comes again (and it always does), there is a collective sigh heard throughout the land. We have made it once again! A soft blue, sugarcoated with white, greeted me in the early morning light. Powdered sugar, disguised as snow, has accented trees, shrubs, and rooftops. The first snow never fails to make me smile. It is the absolute indicator that I am moving into another season; one that is fresh, new, and full of surprises. Moving forward brings along a sense of excitement. Streetlights glisten far off in the distance against a gray sky. The morning sun may stay hidden for a while, as the new day grows lighter. All is hushed and quiet. I am luxuriating in the moment. Slowly, I close my eyes and take a deep breath. I am having a "puddle" moment where my entire being slowly spreads out around me and peace fills my heart. The month of Hísmië is the month of being thankful. An attitude of gratitude never fails to bring with it a sense of wonder as to what is going to appear around the next bend. As I walk through all the seasons of my life, I am learning to look forward to whatever each day brings. There was a time when my heart cringed (and quivered) with the dawning of a new day. I was afraid of being hurt again....and again. Literally, I did not think I would be able to make it through the day. However, I have since learned that there is a link. The Bible says to "give thanks in everything", not for everything. A light came on and I realized that in the middle of awful circumstances, I am able to give thanks. It was a powerful lesson for me to learn. Giving thanks in the middle of the mud (so to speak), cleared my mind and gave me the power to overcome. Each day will bring what it may and I now have the courage to meet it head on. My heart grew wings. But I had to walk through the mud in order to learn to fly.